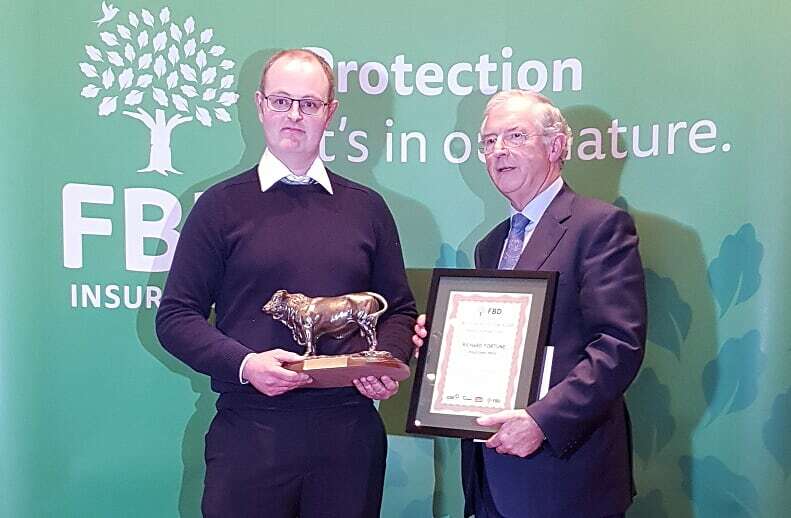 Richard Fortune (left), Co. Wexford, national pedigree herd winner of the FBD €200 replacement index herd competition pictured with Michael Berkery (FBD). Joe and Richard of the ‘Knottown’ prefix were crowned national pedigree herd winners of the FBD €200 replacement index herd competition which took place in conjunction with the inaugrual ICBF & Sheep Ireland Genetics conference at the Hodson Bay Hotel earlier this month. The Fortunes took the overall award having won the Leinster title earlier in the night. The munster pedigree herd winnners were James & Elizabeth Lynch of ‘Polar’ Charolais, Co. Kerry while Kevin O Brien of ‘Turloughmore’ Aubrac, Co. Galway was crowned Connaught/Ulster pedigree herd winner. The Fortunes are farming 120 purebred Salers cows on 220ac of grassland and 50ac of cereals just outside Wexford town. The Fortunes got into Salers cattle a number of years ago while seeking a cow type that was capable of calving a sizable Charolais X calf. There are 120 purebred Salers cows on the farm and there are about 10 purebred bulls being sold each year. There is a commercial element also running alongside the pedigree system with the cows split into two groups. The best group of cows are bred to a Salers bull which gives the Fortunes a batch of purebred Salers calves and the second group of cows are mated to a Charolais bull. All of the Salers X Charolais progeny are sold commercially, the bulls in an under 16-month bull beef system. On pedigree bull selection, The Fortunes won’t register any bull that is over 45kg in weight at birth. They believe that there is always a danger that certain traits begin to slip within a breed. 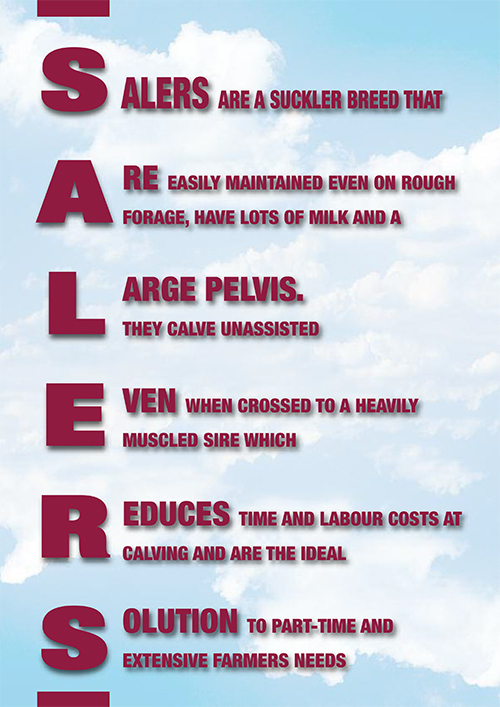 By ensuring only sires that are easily calved enter the breeding system, they believe it is the best way of keeping calving difficulty within the Salers breed down. Currently, the Fortunes are using a combination of AI and stock bulls for breeding. Knottown Roy (SA4604) made it on to this winter’s Gene Ireland programme. Roy is a son of Beguin, Knottown Roy had the highest replacement index of the new Gene Ireland bulls. His current figires are €272 and a figure of 13kg for daughter milk and -4.7 days for calving interval. He is also five-star within his breed for carcase weight and carcass conformation, with figures of 21kg and 1.38, respectively.